The story of an Amazonian guide and the two European scientists who employ him in the search for a sacred plant. Embrace of the Serpent is a rich and entertaining film that never backs down from its commitment to even-handedly show the complicated ways in which different cultures interact. 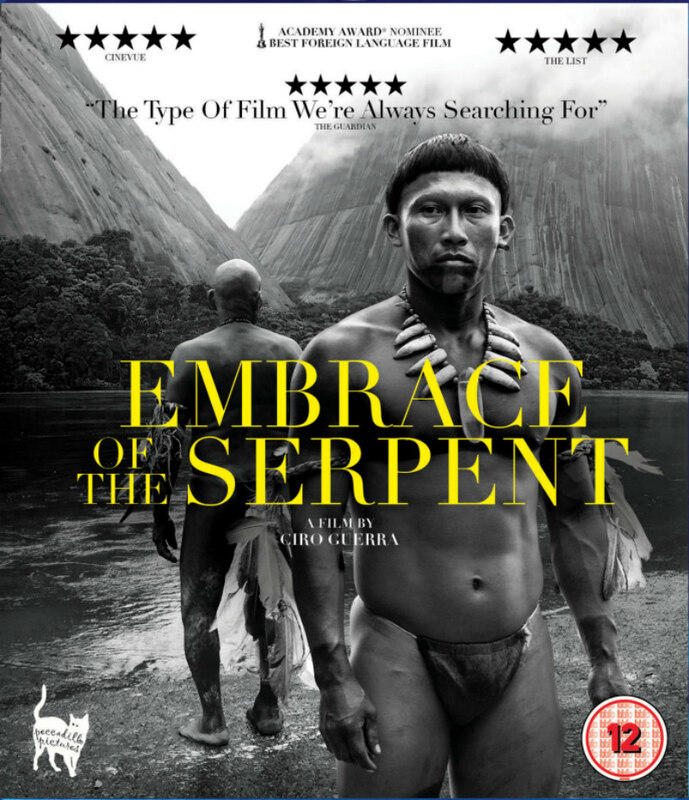 One of the nominees for last year’s foreign language Academy Award was Embrace of the Serpent, the third film from the talented young Colombian auteur, Ciro Guerra. Wrapping sumptuous tropical visuals and probing cultural reflections into a Heart of Darkness style adventure that experiments with time and setting, Embrace of the Serpent is a rich and entertaining film that never backs down from its commitment to even-handedly show the complicated ways in which different cultures interact. Embrace of the Serpent oscillates between two narratives, both set on the winding, spiritually charged Amazon River. The film’s principle character is Karamakate (played by both Nilbio Torres and Antonio Bolivar), an Amazonian native who is the sole survivor of his tribe. In the first story, set during the first decade of the 20th century, Karamakate encounters Theodor Koch-Grunberg (Jan Bijvoet), the real-life German anthropologist, who is accompanied by Manduca (Yauenkü Migue), a native and former slave whom Koch-Grunberg has taken on as a research assistant. The scientist is deathly ill, and Karamakate believes that yakruna, a fictional hallucinogenic plant, is the only cure. In the second narrative, set about thirty years later, Karamakate is chanced upon by the equally real-life Richard Evans Schultes (Brionne Davis), an American botanist who, having read Koch-Grunberg’s work, seeks the same plant. As the film alternates between the parallel quests, we hear the wisdom and worldviews of the Amazonian and the “Westerners” interspersed between Conradian episodes of surreal culture clash between the indigenous and occupying cultures. In the 16th century, the Lope de Aguirres of the world brutally swept into South America, leaving an irreparable gash in the cultures of those who had long inhabited the continent. In the late 19th and early 20th centuries, the Brian Sweeney Fitzgerald “Fitzcarraldos” of the world got rich by robbing Amazonia of its natural resources and further subjugating the indigenous peoples’ way of life. Embrace of the Serpent tries making sense of the damage and destruction caused by madmen like the ones brought to demented cinematic life by Werner Herzog and Klaus Kinski. If Aguirre, the Wrath of God (1972) and Fitzcarraldo (1982) are feverish looks at the destruction waged by European megalomaniacs, Embrace of the Serpent is an amazed, yet calm look at the ruins not long after the fever has subsided. All in all, Guerra’s approach is open and humanistic where Herzog’s was one of pure nihilism. Guerra doesn’t denounce the white characters—he’s sympathetic with their desire to learn and document Amazonian indigenous culture. But Guerra doesn’t let them off the hook either. At the outset of both stories, he aligns us with Karamakate’s perspective: both white men slowly approach the Amazonian shaman via canoe. The camera takes Karamakate’s place, allowing us to see these men with his sense of suspicion. As if to partially confirm that suspicion, both the German and the American show a certain callousness; their dedication to Amazonian culture is largely clinical, as illustrated by the boxes upon boxes of records both scientists schlep around the challenging topography of the Amazon—the boxes which their native guide constantly suggests they unburden themselves of. Nevertheless, the predominant strength of Guerra’s film lies in his depiction of the natural exchanges and contentions between these two vastly different ways of seeing the world. 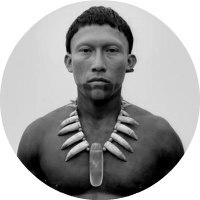 Embrace of the Serpent is at its most interesting when playing Amazonian and European mindsets off of each other; the film smartly avoids strictly praising one and condemning another. In the film’s most harmonious scene, Koch-Grunberg performs goofy sketches and explains navigational science to one tribe—a scene counterbalanced by the hellish one in which Karamakate and Schultes happen upon a maddened Kurtz figure who has brainwashed a large group of natives into believing that he is Jesus. “They are now the worst of both worlds” the elder Karamakate muses calmly, criticising the totality of all he’s observed. In between these extremes, the native guide and his scientist followers engage in many fascinating debates regarding how culture should be recorded and disseminated. In the film’s closing credits, title cards read: “This film is inspired by the travel diaries of Theodor Koch-Grunberg and Richard Evans Schultes. These diaries are the only known accounts of many Amazonian cultures. This film is dedicated to all the peoples whose song we will never know.” The film closes with its most direct and powerful comparison of the two modes of knowledge: we may never entirely understand the ephemeral worlds of these cultures in all their spiritual profundity, but thanks to Western knowledge, we can at least know and appreciate that those songs existed. Two exceptional performances are given by the two actors playing Karamakate in his young and old iterations. As the young Karamakate, Nilbio Torres perfectly embodies a courageous young man who is outraged by the destruction of his world yet tentatively open to observing and guiding others, just as his old world had taught him to do before its destruction. As the old Karamakate, Antonio Bolivar plays the same man, paradoxically wiser through his years of experience and more confused amid the violent chaos of it all. Of course, much of what enhances these performances is stylistic. Guerra and cinematographer David Gallego use rich black-and-white photography to capture Karamakate standing tall and proud as a young man and withdrawn and imperturbable as an older one, all while their camera slithers over the river and through dense tropical foliage with the serpentine grace of the titular anaconda deity. The film, as strong as it is in its pensiveness and visual lushness, can be slightly plodding at times. Seeing as the search for the yakruna plant serves as the driving force of both storylines—and for different reasons for different characters—the film could have treated the search with greater obsession. This would have made the film’s kaleidoscopic finale a striking climax instead of what feels like just another exploratory episode. Still, I’m perfectly willing to accept the argument that, according to Karamakate’s belief system, goals are not as important as journeys. If Guerro’s film lacks an accumulating intensity, maybe it’s because the filmmaker is trying to get us to see things with the eyes of an ancient Amazonian—just as Karamakate did for his scientist audience—thus keeping that unique and mysterious spirit alive. Embrace of the Serpent is on DVD September 12th from Peccadillo Pictures.